SEOUL • South Korea's disgraced former president Park Geun Hye was jailed for 24 years yesterday for corruption, closing out a dramatic fall from grace for the country's first woman leader who became a figure of public fury and ridicule. 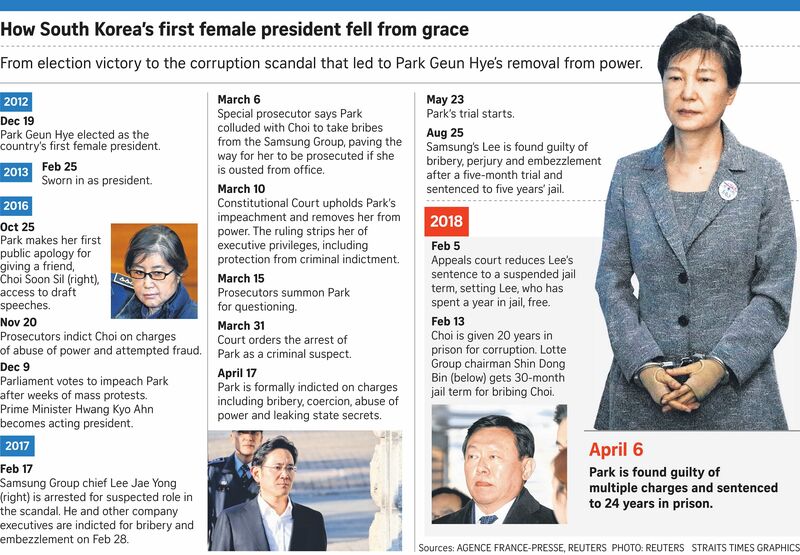 A trial lasting over 10 months ended with Park - the first democratically elected leader to be forced from office - being found guilty on multiple criminal charges, including bribery and abuse of power. A South Korean court found Park guilty of colluding with her long-time friend, Choi Soon Sil, to receive or demand more than US$20 million (S$26 million) from South Korean conglomerates, sharing secret state documents with Choi, ordering officials to stop offering state subsidies to artists critical of her policies, and firing officials who resisted her abuses of power. Most of the money was intended to bankroll non-profit foundations run by Choi's family and confidants, and to fund the education of Choi's horse-riding daughter, the court said. "The defendant abused her presidential power entrusted by the people and, as a result, brought massive chaos to the order of state affairs and led to the impeachment of the president, which was unprecedented," judge Kim Se Yoon said as he handed down the sentence. Park, 66,was also fined 18 billion won (S$22 million) over the charges. The judge said she had shown "no sign of repentance", but had instead tried to shift the blame to Choi and her secretaries. Her downfall was sealed by a fallout between Choi and her rumoured lover Ko Young Tae. Mr Ko tipped off two broadcasters about the abuse of power by Choi and Park, including secretly videoing Choi bossing around two presidential aides and giving the footage to the media. The defendant abused her presidential power entrusted by the people and, as a result, brought massive chaos to the order of state affairs and led to the impeachment of the president, which was unprecedented. Park, who has been in jail since March last year, was not present in court. Mr Kang Chul Koo, one of her state-appointed lawyers, said he would discuss with her the possibility of an appeal. Yesterday, hundreds of her supporters gathered outside the court, calling for an end to "political revenge" against her. Choi, the daughter of a shadowy religious figure who had served as a mentor to Park for decades until his death in 1994, was tried separately and sentenced in February to 20 years in prison. Park, the daughter of dictator Park Chung Hee, lost both her parents to assassins. She took office in 2013 as a conservative icon who cast herself in the role of daughter of the nation - incorruptible and beholden to none. The corruption scandal exposed the shady links between big business and politics in South Korea, prompting massive street protests against Park. Her ouster last year led to a presidential election won by the liberal Moon Jae In, whose conciliatory stand on North Korea has underpinned a significant warming of ties between the neighbours. Mr Moon's office said Park's fate was "heartbreaking" not only for herself, but also for the country. Park becomes the third former South Korean leader to be convicted of criminal charges after leaving office, joining Chun Doo Hwan and Roh Tae Woo, who were both found guilty of treason and corruption in the 1990s. Park's presidential predecessor Lee Myung Bak is currently in custody as prosecutors investigate corruption charges involving him and his relatives.